My name is my intro. Marvia Malik broke stereotypes and became Pakistan’s first transgender anchorperson, associated with Kohinoor News. She is also the President of Khawaja Sira Society, striving for transgender emancipation. GVS: You are known as Marvia Malik, the first transgender anchor person in Pakistan, how does that feel? 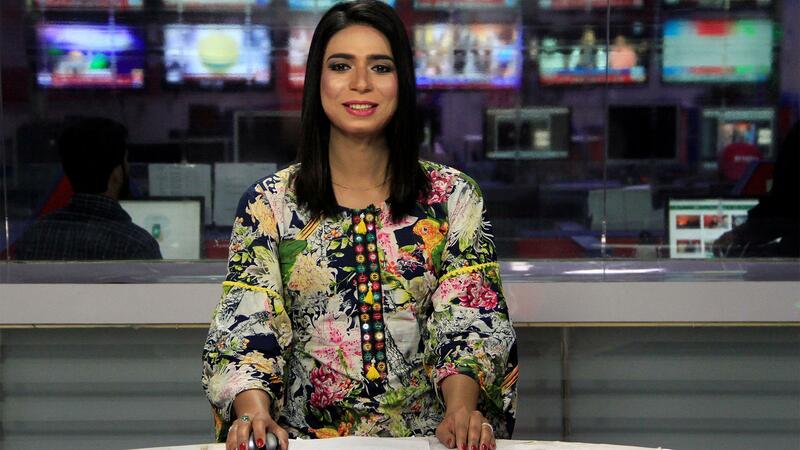 Marvia Malik: Not only in Pakistan, but I’m the first transgender anchor person in the whole world. There is another transgender news person in India, but she’s not a newscaster. She used to run a program, but she was not specifically an anchor. However, I always introduce myself as Marvia Malik only. Most people tell me that my name is more than enough for my introduction. GVS: How would you describe your journey towards success? Marvia Malik: Getting to where I am today hasn’t been easy. My family refused to accept me. I was kicked out of my house and I had to struggle to make a living. I had done a course as a makeup artist which helped me get a job in a beauty parlor. During this period I got a modelling offer and I became the first transgender model in Pakistan. I continued my modelling career and simultaneously decided to pursue an education. It was after my graduation that I was called for an interview at Kohenoor news and I was offered a position as a newscaster. GVS: What does a normal day in the life of Marvia Malik look like? Marvia Malik: I get to the Kohenoor channel office, where my first bulletin is between 3 pm to 4 pm, followed by the 4 pm headlines. There is an hour’s break before I do my final bulletin between 5 pm and 6 pm. I love spending time with my friends so my evenings are often busy with them. I am also the President of the Khawaja Sira Society, an NGO which works on ensuring the transgender community are given their fundamental rights and not made subjects of discrimination. Depending on the day, I often spend my evening working at the NGO, meeting with members of the transgender community to ensure their issues are heard and projected through my personal social media platforms. GVS: It is often the case that fame and success make people less empathetic to the problems in society. What keeps you committed to serving society? Marvia Malik: Yes, indeed when some people become famous, they become selfish, but by the grace of Allah, I achieved this status with the help of the transgender community and I wish to keep working for the betterment of my community. I am planning to register an NGO of my own which will focus on protecting the rights of the transgender community through wide-ranging education projects. However, we currently need funds so that this initiative can take off. A few days ago, I along with the head of the Punjab Committee of Transgender Persons, were at the Supreme Court, to represent the community on the issue of transgender ID cards, in front of the Chief Justice of Pakistan. I was the one who talked to the CJP during the hearing, and he instructed that transgender persons be given free ID cards – which identified them as the third gender – before the 2018 General Elections. GVS: Reflecting on your own experience in university – how were you treated? Marvia Malik: The life of every transgender is full of challenges. Everyone degrades you, hoots and catcalls when you pass by. I didn’t get admission in a girl’s college during my intermediate, so I had to get admission in a boy’s college. I always had to cover my long hair with a cap and everyone used to poke fun at me. The same happened later at my university, people used to mock me and make fun of me, but it had become a part of my daily life, so it didn’t bother me much. GVS: Why did you choose a future in journalism? Marvia Malik: I graduated from university in journalism. In all journalism books, the focus is on the presentation of the news, which I found to be quite interesting, and with time I decided to pursue it as my career. After joining Kohenoor, I only took two months training before going on air. Since I had done extensive research in journalism, I have been able to carve out a satisfying career for myself. GVS: Your voice is heard and respected as a media person, how do you intend to use it in the future? Marvia Malik: As you know, people fear the media. I want to use this aspect to my advantage and help the transgender community. One month ago, officers from a police station, known as City Thana, arrested a few of my friends, mistreated and harassed them, broke their phones and locked them up. When I got the news, I immediately rushed to the police station, bailed my friends and recovered their belongings from the police officials. I also got the police official suspended for his wrongful actions. Similarly, I have been highlighting the issue of ID cards for transgender persons through the media. Transgenders all over Pakistan have started to register for ID cards. There are many more transgender issues that I have highlighted through my news channel, for example, how they survive without their families, how they long to meet their parents. I am trying to send a message to the world, that transgenders are also humans. They feel sadness and happiness like the rest of us. GVS: What are the challenges that you have faced working on electronic media? Marvia Malik: By the grace of Allah, I have never experienced any great hardships while working in media. I am trying to groom myself as an anchor and all major news channels, except for Geo News have given me job offers as an anchor. I’ve been offered double and triple pay, but right now I’m not willing to take that step, since Kohenoor is taking such good care of me. GVS: Have you referred any other transgender friends of yours to those vacancies? Marvia Malik: Definitely, I’m trying to refer other friends to those positions. I even managed to get interviews for a couple of my friends, but unfortunately, none of them could meet the required criteria. That’s why I am trying to get my NGO registered to work on providing educational opportunities to trans genders. I also hope my efforts will compel the government to ensure education rights for the transgender community. If they are not given education immediately, then there should be some sort of skilled training programs for them, so that they can make a living for themselves. GVS: Have you ever thought about an acting career? Marvia Malik: Definitely, a film of mine is coming out in August in which I am playing the role of a transgender. I have also gotten offers for working in three or four dramas. However, my work keeps me occupied, so I am unable to pursue a career in acting, but I have some pending projects and I’ll finish them soon and consider other avenues. GVS: Violence-related incidents against transgenders are being reported these days, have you ever been threatened with violence or death? Marvia Malik: Fortunately, I am very lucky in this regard. I have never experienced or been threatened with violence. Even though I face many issues while commuting, I tackle them myself. However, I faced pressure from my family. They didn’t want me to become an anchor and highlight transgender issues since they felt it could be dangerous for me, but I didn’t experience any external pressure. GVS: Is the transgender community active in politics? Marvia Malik: I have been offered reserve seats by PTI three different times, but I don’t wish to enter politics at this time since I am only 21 years old and one has to be at least 25 to become a member of the National or Provincial parliament. When people ask about my political party preference, I don’t mention any names explicitly and simply say that I will support the party which works for transgender rights and their betterment. Not only me but the whole transgender community will support that party. GVS: This is the first time that transgender people will be casting their vote, after issuance of their ID cards. Which party is likely to get their votes? Marvia Malik: In my opinion, just like every man and woman has a mind of their own, every transgender also has their own unique point of view. Some support PTI, some support PML-N, there is no specific leaning towards any party in the transgender community. GVS: Do you think transgenders need a separate political party? Marvia Malik: They definitely do. If I get an opportunity later on in life, then I will make a party of my own and the whole transgender community will support it. GVS: What is the practical implication of the transgender bill and voting rights for the transgender community? Marvia Malik: In Pakistan, you have to raise your own voice for your rights, no one will give them to you. Many laws are passed in Pakistan with no implementation. For example, the ID card issue was mentioned in the transgender bill, but no action was taken regarding it until we raised the issue in the Supreme Court. We will also raise our voice on other issues as needed and make sure other laws regarding protection of transgender persons are implemented. GVS: What kind of challenges are you facing at NADRA while getting your ID cards? Marvia Malik: The Chief Justice asked us about the most convenient method to get registered and we told him that we wanted mobile officials that would go door to door to register us. Other than that, special centers were created for registration of transgenders, so we didn’t have to wait in any lines. Transgenders got free ID cards for 14 days so that a maximum number of them were registered before the elections. This facility was introduced for those transgender individuals who are unable to pay the registration fee. GVS: There is a lot of segmentation in the transgender community, what do you think about the transgender culture of ‘guru’ and ‘chela’? Marvia Malik: I must tell you that people have to do something to sustain themselves. If they cannot earn any money then they’ll have no option left but to sell their body for survival. Most transgenders and many women have no one to look after them, no employment opportunities and no protection. Their basic needs remain unmet and they are forced to resort to prostitution as their last refuge. The ‘guru’ and ‘chela’ system has survived for centuries. It provided protection to transgenders, in the absence of social acceptance and fundamental rights. Guru is like a mother/father for their chela’s. Many people think very lowly of them, but the reality is very different. Gurus provide protection, safety, sustenance and shelter to their chelas, things that they won’t be able to find elsewhere. GVS: There are a number of videos on Youtube in which gurus are very abusive to their Chelas, they beat them, cut their hair and torture them? Marvia Malik: Cutting hair and beating takes place even in ordinary households, gurus are no different. In-laws fight all the time and do hideous things to each other. There is news of domestic violence every day on the television. If normal people can face these issues, then so can transgenders. The abuse is domestic abuse and it has nothing to do with being transgender. GVS: What are your personal thoughts over its existence – would you encourage or discourage it? Marvia Malik: I would neither encourage nor discourage this system since this is a centuries old system. If I discourage it, then it would affect my image as a representative of the transgender community. However, I won’t encourage it either since I’m not a guru/chela for anyone and neither do I have plans of becoming one. I advise others to become independent, but at the end of the day it is a personal choice, I won’t judge anyone for it. GVS: How does the media portray transgenders? Marvia Malik: While there is good media, there is also bad media. Some channels present transgenders in a very negative manner. They poke fun at them by dressing people up as transgenders for entertainment or ratings. Such channels begin to influence the perception of viewers in subtle ways penetrating the minds of people. When transgenders are presented as a joke to the world, people start treating them like a joke and no one takes them seriously. On the other hand, the media is also playing a very positive role in highlighting the issues of the transgender community. Media is also putting an end to the myths about transgenders by showing them in different positive roles in society. Society should start accepting transgenders for who they are. Don’t think of them as men or women. Don’t judge people for what’s underneath their clothes, judge them for their talents, capabilities, strengths and their potential role in society. GVS: Your story reflects a deep passion to succeed, do you feel an average Pakistani transgender, with enough struggle, can get similar opportunities in Pakistan? Marvia Malik: Whatever I’ve said, I’ve implemented it in my own life. My views are based on my personal experiences. Every transgender should do these things, the ones who don’t, end up begging on the streets. They are also not given any opportunities. I feel very lucky that I got the right opportunities. GVS: What message would you like to give to people who have been in the same situation as you? Marvia Malik: There are a great number of transgender people who fail to face these pressures and lock themselves up inside their four walls. They don’t study or get any skill training. They only leave their home in the dead of the night, so no one can see them. Even if they are spotted, people are not able to recognize their gender. I want to tell them, whoever they are, they should go out, face the world, find their hidden talents, focus on their education and technical skills. Hiding inside your home is not the solution. I would like to give the example of an ordinary Pakistani girl. When a girl leaves her home, she also experiences a lot of hardships. Similarly, a transgender has to experience a lot of difficulties, but just like the ordinary Pakistani girl that never gives up, transgender persons should also not give up. They should face whatever life throws their way and keep going.